"How far off is a dream?" - The More I Read. . .
"How far off is a dream?" Based on my track record, I probably shouldn't have liked The New Zealander as much as I did. I mean, you have to buy into the fantasy, believe in the fairy tale, sometimes suspend pretty much all belief that the world is round, that gravity always wins, and that the sun rises in the east and sets in the west. But I did. I really, really, really liked it. In fact, I can't remember when I laughed so much or so hard. For the chuckles alone, I should give it five stars. But wait, there's more. Summarizing the plot in The New Zealander is going to sound like I've been smoking wacky weed or coming off a week-long intravenous feed of nothing but Ghirardelli's dark chocolate and sea salt caramel. It's crazy and frenetic and at times as incomprehensible as the morning after a weird dream where the bits and pieces recalled feel like a jigsaw puzzle with the pieces just slightly off and not quite fitting. But I liked it. I really, really, really liked it. Deep breath. Here goes. Abigail Ash is a 23-year old young woman who lives with her Uncle Tod and younger (by six years) sister, Nancy, on Spice Street in the sleepy little suburb of Rushfield on the outskirts of Sydney Australia. Rushfield boasts a race course, a small shopping center, and a few paved streets, but the race course is the most exciting thing in town. Abigail works at Stanways (not really sure what they do) Monday through Friday, rides the bus to and from with Daryl Webley, who also works at Stanways, a young man she's had an "understanding" with for five and half years, does her chores on weekends, goes to church every Sunday. On Saturday night, she and Daryl go to the "pictures" (cheap seats only) and share a "plate of toast afterwards for supper and divide it in two." (Daryl is really enthusiastic about saving money.) Every second Sunday, Abigail visits Daryl at his mother's home for tea (he lives on Cinnamon Street) while Mrs. Webley makes sure Daryl is kept exactly where he belongs - right under her thumb. No vamping in her parlor every second Sunday. That's about the sum of Abigail's life. Oh, except she took a ton of cooking classes at the Tech, from "Elementary to Advanced including Jams and Pickles." She is also quite proud of the fact that she can cook "invalid", too. Everything probably would have continued this way until Abigail was old, dried up and shriveled. Except for two things. First, she overhears a shocking conversation between Nancy and Uncle Tod one Saturday morning. Abigail with her hair tied back with a shoelace and in her bedroom slippers in "Saturday morning fashion" needs mint for the potatoes so out to the vegetable garden hidden behind the trellis of pink geraniums. Nancy and Uncle Tod were on the veranda (only used for "family conferences" because the veranda was too hot in summer and too cold in winter), but the mention of her name made her lean toward the trellis. Nancy is in love with her high school beau, David, and they want to marry. Like right now. They've even found a cute little bungalow they could move into, but they'd have to reserve it. All plans are on hold because Nancy needs Uncle Tod's permission to marry since she's underage, and Uncle Tod refuses because he has this old-fashioned idea that Abigail, the eldest, should marry first. Nancy wails that it's not fair, that Abigail "settled" for Daryl and will be waiting for him forever, and Uncle Tod placates and scolds her, even saying Abigail is "still rather immature for her years", but he refuses to budge despite pleas, threats, jeers, and tears from Nancy. Abigail is stunned out of her stupor by the thought that she has been complacent and begins to think it's time to pin Daryl down to something more definite than the vague "in the future", "in time to come", and "eventually" he usually uses to put her off. But first, there's Daryl. Daryl is tall, wears rimless spectacles, not a fan of PDAs (poor taste, don't you know), nor is he a fan of "bare words" (see "eventually", etc.). He is a fan, however, of disapproving looks for Abigail especially when she does "embarrassing" things like talking to herself or kicking pebbles (it's "childish and wears out the toes of her shoes"). I think everything embarrasses Daryl, probably when she breathes a little too deeply or just exists. Like Abigail, he works at Stanways (Monday through Friday on the bus there and back), home at night with mother, Saturday chores - manicuring the lawn, upkeep of Mum's house, whitening the stepping stones, and scraping the moss from the stone frogs in the yard. You've heard that a rolling stone gathers no moss, right? Well, neither do scraped stone frogs, and those stone frogs surely can gather A LOT of moss. Hmm, I think I know why Mum doesn't want to lose her boy. Very handy is Daryl. Saturday nights is economy dating with Abigail - the cheap seats "picture" night and one plate of toast divided in two after - church on Sunday, and every second Sunday tea with Mum and Abigail. I'm just surprised Abigail hasn't died of inertia after five and half years of this routine. Abigail heads off to Cinnamon Street in her Saturday fashion of slippers and shoelace tie back instead of the "secure roll Daryl approved." She's pretty sure Mrs. Webley will not be happy to see her. After all, it's the wrong day of the week and the wrong week. Routine is everything with the Webleys. Abigail's also thinking about a rather odd ad she answered even as she frets about braving the dragon, er, I mean Mrs. Webley and actually confronting Daryl about setting a date. You know, when the door knocker is a gargoyle, it's probably a sign to run away. Far, far away. But Abigail loves her sister, is determined to make Nancy's dream come true, and she is determined to do something. Besides, she's invested five and half years so no gargoyle on the door or one answering the door is going to turn her away. Even if in her haste she accidentally leaves her dirty foot mark on the freshly whitened stepping stones and a corresponding white foot mark on the perfectly manicured lawn after stepping off the blindingly white stepping stone. Oops. 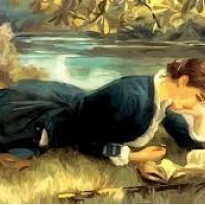 - Abigail has been "masquerading as a nice lady-like young woman all these years when all the while she was really nothing but a hoyden." - She's trying to "hustle" him. Abigail explodes, she's tired of "eventually, in the future, in time to come"; it's "now or never." And then going, going. . . Gone. As she leaves, she tells Mrs. Webley: "I won't be here on Sunday week, nor eventually, in the future, in time to come." She's pretty sure the Webleys are more concerned with the waste of all that money for five and years of cheap seats at the pictures, supper after, and all those Sunday teas than her feelings. Wanted: Personable young woman. Able to cook. Willing to travel. Strictly respectable position. Time limited. Apply at once. 'Dear Miss Ash, The position is yours. If you call at the hotel above and ask for the name below, we will go into details. Assuring you of my honourable intentions. Yours truly, Titus Brown. On a rather circuitous way home she crosses the "green sward" close to the horse paddocks of the race course and comes face-to-face with Mr. Titus Brown leading a chestnut filly into a paddock. He recognizes her from her picture and assumes she's come to talk about the position. What follows is a lot of almost incomprehensible conversation - mostly because of Titus whose conversation skills soar to the heights of almost lucid and dip to the depths of mostly muddled. Abigail is not impressed by Titus. He is "quite unremarkable", "quite unhandsome", and just about as average in height and build as a man can be and with a slight suggestion of a Scottish burr in his accent. The only thing not average about him is his coloring. He has "vivid red hair that was grizzling at the temples, and the two colors, red and grizzle, did not blend." He's dressed rather shabbily in an old tweed jacket, baggy sweater, cord trousers, and rubber boots. Plus he tends to turn "brick red" in embarrassment clashing with his unfortunate ruddy grizzled hair. Running frustrated hands through his hair leaves red and grizzled spikes making him resemble a distressed ginger/gray hedgehog. Except not so cute. Honestly, he's kind of a mess all the time, buttons hanging by a thread, ill-fitting trousers and jackets, and all of it strictly utilitarian and practical. His eyes Abigail rather unkindly likens to a "mustard pickle" color. In fact, "pickle eyes" becomes her favorite descriptive of Titus, especially when he's done/said something that puzzles or angers her. He explains the ad should have been worded "reasonable", not "personable" (not the first time the Rushfield Runner has misprinted an ad), and she explains the mess she's in with her sister, her uncle, and the newly cast-off Daryl. The air is cleared somewhat, and they make a deal: he'll pretend to be her fiancé if she'll come back to New Zealand as a cook for a mysterious venture he just received a permit to operate. Abigail explains she'll need an engagement ring in order to convince Uncle Tod the lynx which Titus just happens to have in his pocket. He must have been a Boy Scout. Or maybe he has a hidden agenda and something else is going on. Hmmm. 'My uncle is a lynx,' she warned. Why won't he tell her what the place is? Because he wants her "first impressions" and because, even more mysteriously and vaguely, because he believes her to be "the answer" to his hope. All she knows for sure is that the place is not a sheep station, a stud, a farm, an orchard, a school, or a hospital though her expertise at "invalid" meal preparation may be useful. In good faith, he gives her references from his banker, his solicitor, his minister. She shows him her certificates for cooking. They return to Spice Street where Titus transforms from barely coherent and uncertain to "bland and assured", convincing Uncle Tod so thoroughly Titus is soon fondly referred to as 'son' and Nancy is sighing in romantic raptures as Titus declares in a poetic, heartfelt manner that "once in a great while you meet someone, and there's something between you." Abigail? Well, Abigail just thinks he has an "old hat manner to match his name", that there's "nothing smart about him", and that drivel makes him sound like an author. Actually, Abigail wasn't too far off because those words are from a book. Written by Titus's handsome, younger brother, Peter. Titus placates Uncle Tod's insistence for a wedding sooner than later by telling him that the church (Titus helped build the kirk) still needs a roof. A few days later, Abigail is on her way to Fiordland, New Zealand ('the gateway to the Sounds') and Nancy's wedding is set to occur in three weeks. All's well that ends well. Right? Not exactly. First, two crossings by ship prove Abigail is not meant for sea travel. Then once in Fiordland, Titus's truck breaks down in the rain, and he sends her on ahead by foot after scratching his head, poking under the hood and squinting at the dashboard. To add insult to injury Titus's mysterious business venture is a rundown inn Abigail nicknames "The Horror" but is known locally as "The Open Arms." There are comparisons I could make between Titus and "The Horror", but I won't. The "Open Arms" inn is a mess, slanting, crooked, peeling paint, no paved path. But the backdrop is a "pansy-dark mountain" that "catches the pulsing amber of late afternoon", a cascading creek that "rainbowed down a ferny glen." In front of all that beauty is "The Horror." Inside is no better. Cobwebs in the hall, ten very unappealing bedrooms, some with "chinks of windows", some without windows at all. Two bathrooms - both dark and ancient with dirty grey baths. In the kitchen is a "big, grumpy-looking fuel range, crooked stacks of old crockery, sullen cut-saucepans, frying pans you would need all your strength even to push over a flame" with an aged dark plastered ceiling crisscrossed with wooden rough beams and dreary paneling. Then she sees the taproom. It was unspeakably dusty, everything shabby and rusty, but in some strange fashion it had a golden mellowness about it that kept her standing on the top step, standing stock still. There was a dark, old bar, and among the dusty tankards there were some that looked like pewter. With a fire in the fireplace that took almost all the south wall, a wind sucking up the smoke so that the flames leapt high, the glow would imprison the pewter. Abby caught her breath almost achingly at the thought. Unconscious of moving, she went down the well-worn steps and stood among the old brews. 'Here's something else, girl,' called a voice from the top step, and Ab knew by the breathless note that Titus Brown had sensed and caught her mood. I loved that part. Amidst the grime and dirt and horrifying monstrosity that is The Open Arms Inn, Abby fell a little bit in love with the old place. Falling in love with Titus Brown takes her a little bit longer. Titus improves the more you know him, the more you see him. Bramble eyes Abby likened to "pickle" take on highlights she'd overlooked, like "firelight on old pewter." Titus "with the heart of a lion but the delicacy of an elephant" unashamedly uses snippets from Peter's books to woo Abby. She's very angry when she discovers his "once in a great while" and "just the two of us pinned there in life's pattern" lines are in the dubiously titled Yesterday's Tomorrows (by Peter Brown) though Titus is just amazed she believed he came up with them in the first place. "You couldn't have thought it was mine, girl. You must have heard how incoherent I was." "Yes, but I thought. . . that is. . ."
"What did you think, Abigail?" His eyes were now leveled on hers. "Oh what does it matter?" Abby snapped. "It's all too silly." She added hatingly, "And Nancy thought it was you, too." "Abby I'm sorry if I've disappointed you." "Disappointed me? As though you could!" "Titus," Ab exploded, pushing it under his nose, "haven't you any words of your own?" No she's not ready. Not yet. First there's the taciturn disapproving Mrs. Macbeth (the housekeeper) to win over, the handsome innkeeper of The Traveller's Rest right next door who turns her head for a time, lots of letters from Spice Street inquiring about a wedding date, several delays in Nancy and David's wedding, stitching up Brown the dog after going 13 rounds with a wild pig, a pardoned wapiti, the adoption of Fawn the fawn, refurbishing The Open Arms, pompolomas for sixteen hungry tired Americans, one guest stuck in a bathtub, a frog crisis, meeting Titus's younger handsome brother, Peter, who turns her head the other way, and a partridge in a pear tree. Just kidding about the last one. I wondered when, or if, poor Titus would ever get the girl. I love Titus. I love his awkwardness, his determined cheerfulness in the face of disaster after disaster, his unbridled optimism, his stubborn refusal to quit at the first obstacle, but especially his "pickle eyes." Though Abigail sees him as average and unprepossessing, Titus is not your average Harlequin hero. He's not wealthy or suave or debonair or self-assured, nor is he arrogant or mean-spirited. At times he's clumsy, a bit shy and stumbling in his pursuit of Abigail, and he has an unfortunate affinity for falling into streams, creeks, and frozen ponds. When Titus isn't bumbling around with his courtship of Abby or trying to restore The Open Arms, he's recuperating from sniffles and sneezes caused by plunging into the nearest body of water. He trips on a bottle Abby used to feed an orphaned fawn and rolls and tumbles into the stream again which sent him to bed with sniffles and sneezes. And then there was the eel incident. I know eels aren't snakes, they're fish. But they look like snakes to me. Abby sees eels in the shallow creek close to the inn, thinks they're cute and begins feeding them. Why? Just why? As interesting as it was to learn that the river in Abby's old hometown had an aboriginal name meaning "Place where eels sit down", I'm not particularly keen on anything that resembles a snake. Nor will I ever be caught feeding them. FYI, they like meat, not blancmange. As she's feeding them one day, one bites her fingertip, (See! I told you so!) and she screams, Titus comes running to rescue her from drowning in the shallow creek and lands in it himself. As Mrs. MacBeth the housekeeper keeps saying: Wet again,Titus? And it's not the last time. Titus's heart is in a good place though he's not the sharpest knife in the drawer about some things. He genuinely loves his brother and since he's a fixer upper, he tries to fix his brother's love life. He's a dreamer. He has this cockeyed dream to make the Open Arms prosper, to have Abby see and share his dream. Ab, mopping up Fawn now, looked across the silken ears to see Titus looking intently at her. "What are you gazing at?" she demanded, abashed. "You - old and grey, tottering round the inn." "You have a vivid imagination, Mr. Brown." "Grey is not a vivid colour, but it looks well with the lavender dress you're wearing," he went on. He had a grand plan when he hired Abby as a cook, but the plan backfires on him when he falls in love with Abigail Himself but has to take a back seat to the innkeeper next door and his brother, Peter. As clumsy and awkward and unpolished as he is, he's also tender hearted and kind and generous. Titus isn't the kind of man who beats on his chest in a display of alphatude. He talks big manly man talk about shooting a wapiti to replace the dusty, moth eaten old "Tom" of the battered antlers over the fireplace, but, when push came to shove, Titus couldn't do it. I adored the final confrontation between Daryl Webley, Titus, and Abby. Totals are tallied, two engagement rings are produced, insults are hurled, punches thrown, and Titus grabs hold of Daryl by the scruff of the neck and the seat of his pants and tosses him out of a hotel. Maybe Daryl can scrape Mr. Burns' mossy statue in the Octagon at Dunedin instead of the stone frogs. Or not. Abby begins to notice "the bramble eyes she chose to call pickle" "suddenly the had firelight them. Firelight on old pewter." Abby took a long time to get there, but once there, she wasted no time. 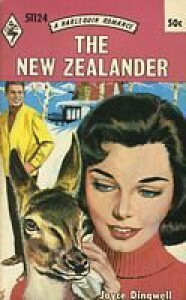 She met with the minister and arranged for a wedding the next day, invited Peter, and enlisted the help from Donald MacBeth who handles all of Her Majesty's Mail in Fiordland via a cable to Spice Street, Australia: MARRYING THE NEW ZEALANDER TOMORROW. Letting Donald in on her plans is the equivalent of renting a billboard. Within minutes everyone around the community would know. Plain-spoken Donald wants to know which New Zealander, and her reply is just about perfect. She thought of the taproom that was not going to be missed. The firelight on pewter. Wind sucking up smoke. I loved it and this book. My only disappointment is the very rushed ending. I really, really wanted to see Titus's face when Abby finds him at the Traveller's Rest learning how to hang a deer over the mantel without it appearing to lean and leer.